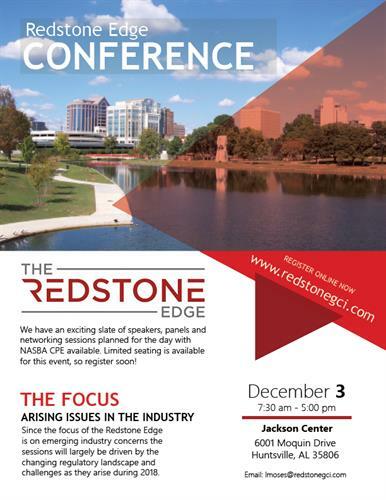 Join us for the Redstone Edge Conference for an exciting slate of speakers, panels and networking sessions planned for the day where you will earn NASBA CPE. We are happy to help with accommodations for other CPE types and should you have any questions, please contact lmoses@redstonegci.com. Limited seating is available for this event, so we hope you will register soon! In the coming months, we will be adding highlights of the day’s sessions and will continually update this page as we develop topics and identify speakers. Currently, we have commitment for SES-level participation from several Government agencies, as well as noted industry experts and some special sessions presented by our Redstone GCI Team. Since the focus of the Redstone Edge is on emerging industry concerns the sessions will largely be driven by the changing regulatory landscape and challenges as they arise during 2018. We’re also growing and will have the entire 13,000-sq-ft Jackson Center facility for use of our conference attendees. Keynote sessions will be hosted in the large meeting rooms with breakout sessions hosted in other conference facilities, as well as dedicated space for attendees to break away during the day to handle any issues that come up back at the office. We’ve heard your requests for more time to network with attendees and our presenters and have added dedicated time throughout the day to allow for more networking. We’re also inviting other service providers to exhibit during the conference to allow you an opportunity to meet parallel partners who we’ve come to know and trust.